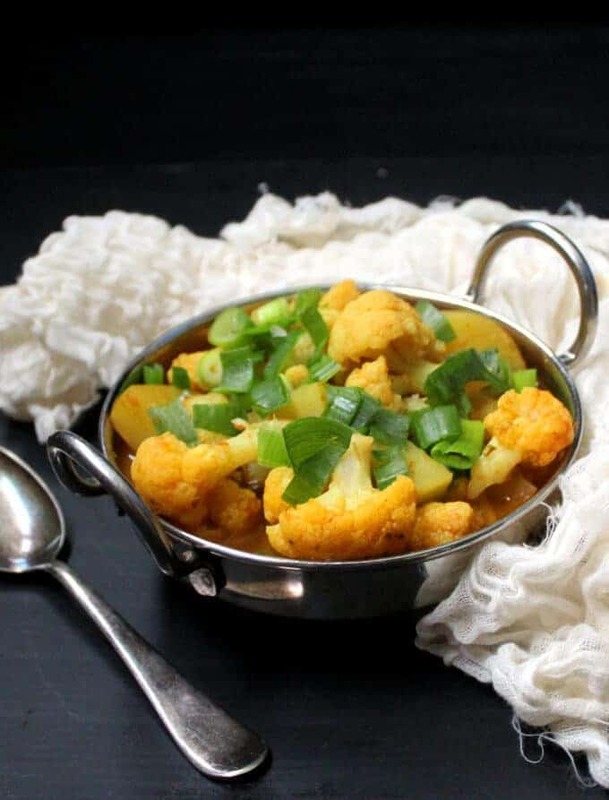 This Cauliflower Curry with Potatoes is a beautiful way to showcase this versatile Fall vegetable. Indian spices add depth and flavor, and tons of deliciousness. Serve with rice, roti or bread. 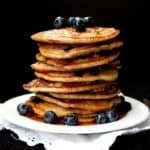 A vegan, soy-free, gluten-free and nut-free recipe. Because of its immense popularity in recent years, and the fact that it’s readily available year round, one tends to forget that the mighty cauliflower is actually a Fall vegetable — in other words, this is peak season for this cruciferous veggie. 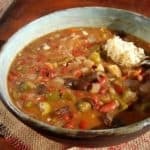 So if you believe, like I do, in eating seasonally as much as possible, this recipe is for you. Cauliflower, despite its versatility, can be a difficult vegetable to cook with. Overcook cauliflower and it turns into a smushy, smelly mess that I simply cannot — and will not — stomach. 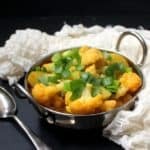 That can also be a challenge when making Indian foods with cauliflower because we Indians tend to overcook our veggies, especially when we add them to curries. 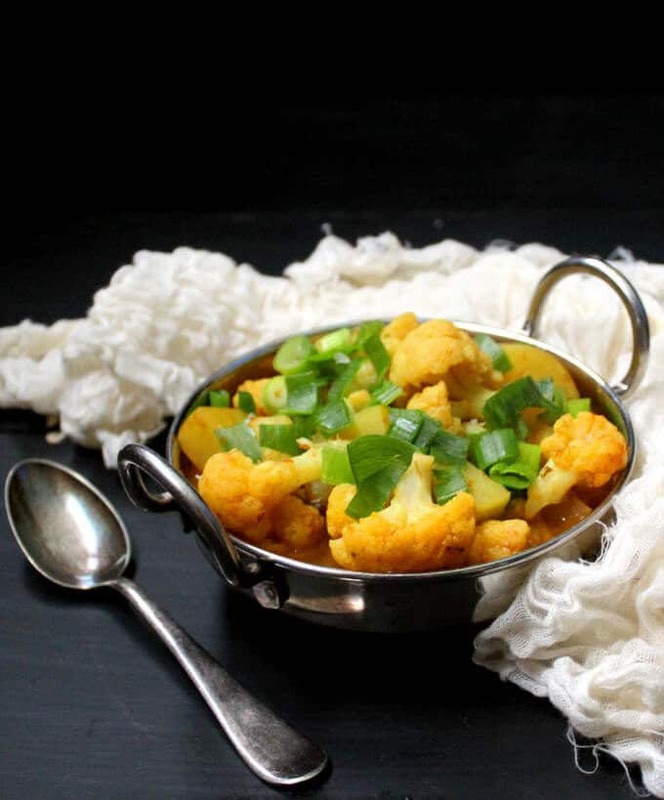 It’s also hard to find too many interesting Indian recipes with cauliflower, save for the ubiquitous Aloo Gobi or Gobi Masala. 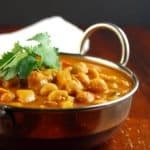 Over years and years of sharing recipes with you on the blog, I’ve tried to create a few offbeat recipes with strong Indian tones, like my Creamy Cauliflower Curry with Basil, a baked Chickpea and Cauliflower Curry that’s a perennial favorite in our home, Roasted Cauliflower and Chickpeas with Indian Spices, and a Cauliflower Rice Biryani, to name a few. 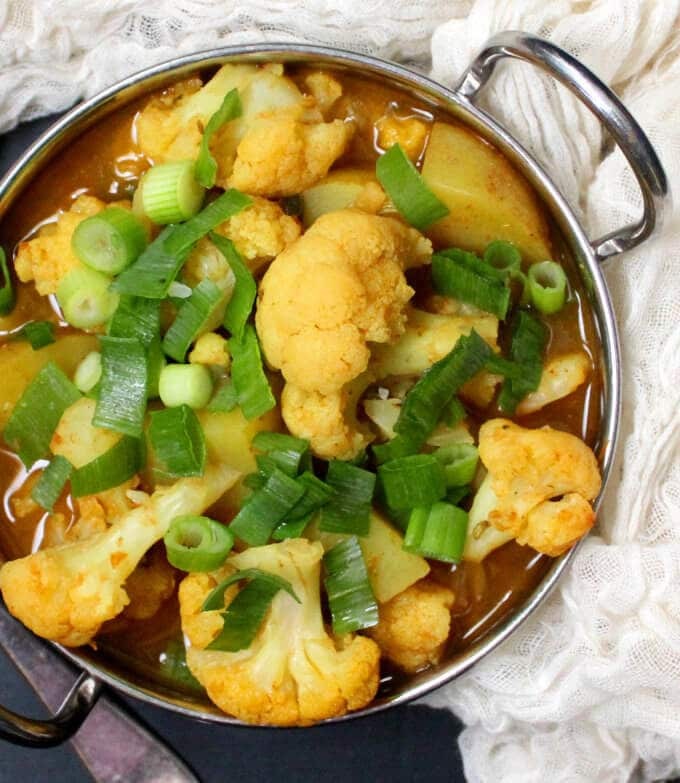 The recipe I have for you today is another one I am proud to share with you: my Cauliflower Curry with Potatoes. 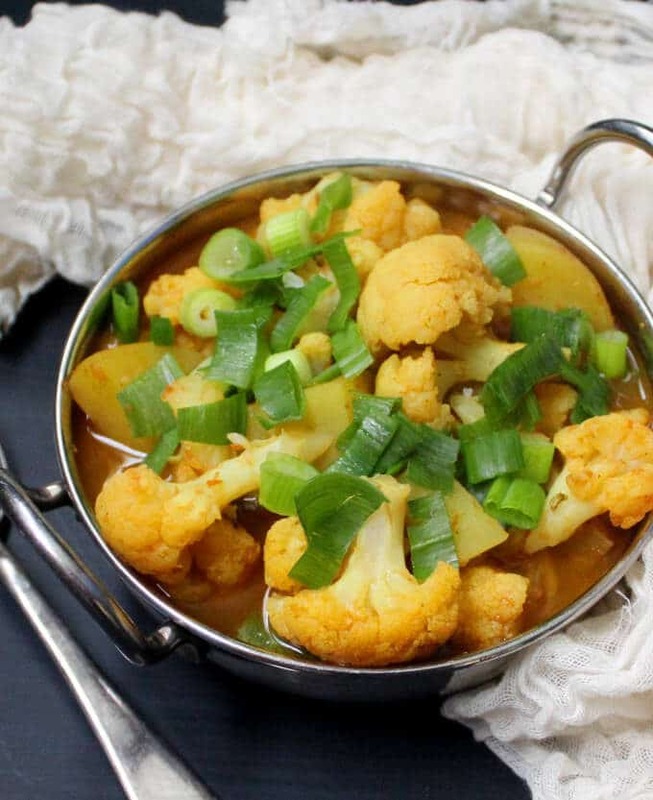 It’s an easy recipe that makes a wonderful showcase for the cauliflower, and it is flavored with fennel seed. If you know someone who doesn’t like cauliflower, this is the recipe to make them change their mind. The fennel is important because it adds a wonderful, subtle but amazing flavor to this curry that makes it rise over and above your run-of-the-mill Indian curry. You don’t need any other special ingredients, so long as you have garam masala and turmeric (and who doesn’t these days? ), you can make it in one pot so minimal cleanup, and it is absolutely delicious served over rice, with roti, or even with crusty bread. 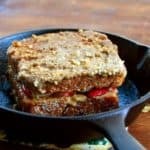 If you try this recipe, be sure to let me know in the comments below. Bye now! Place the garlic, ginger, cumin seeds and green peppers in a mortar and pestle, or in a food processor, and crush to a coarse paste. Bring a large pot of salted water to a boil. Add the cauliflower florets, bring back to a boil, cover, and cook five minutes. Drain the cauliflower immediately, separate into smaller florets when cool enough to handle, and set aside. Make sure the pot is dry, then add the oil and heat. Add the ginger-garlic paste, saute for 30 seconds, then add the fennel seeds and coriander along with the onions. Continue to saute for about five minutes or until the onion is translucent. Add the potatoes along with the tomatoes and turmeric, stir to mix, cover the pot and let it all cook about 10 minutes or until the tomato turns a few shades darker and the potatoes are almost cooked. Add the cauliflower along with 2 cups of vegetable stock or water. Bring to a boil, cover the pot, and continue cooking another 10 minutes, stirring once or twice. Use more liquid if you want a saucy preparation. Check salt and turn off the heat once the potatoes are cooked. The cauliflower should be fork-tender but not mushy. Garnish, if you wish, with some chopped scallions or more cilantro. 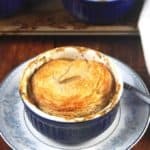 Serve with rice, or with roti or a crusty bread. You can leave out the potatoes if you wish, or add green peppers. Looking forward to trying this soon. Fennel is not only delicious, it will help prevent gas, which the brassica family vegetables tend to create. This looks more like what I wrote you about, the Aloo Gobi in a clear sauce but it seems there may still be more tomato than the dish I had but I’ll surely try yours!!!! I see the GREY FOMNTS is stil here and it is so hard for me and others with limited sight to see! I can’t even see where I make mistakes!!!! Have to use a magnifying glass and it is still difficult! A beauty! 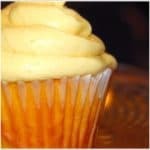 I must try it soon!